Thursday January 16th 1902 Will sold three hogs this morning that brought nearly $65.00. Dell took then down in the waggon and Will went in the buggy and brought Mother back with him. We had such a good visit and Mollie took her home. Friday January 17th 1902 I was busy about the work. We went to town in the afternoon. I took in some eggs and got some groceries. I did other trading, stopped at Woolfs a few moments on the way home. Mollie went home. Saturday January 18th 1902 I have quite a cold and Will very severe one. I was busy about the work all morning and did sewing in the afternoon. Will went down town. We are getting quite a few eggs. weather and roads fine. 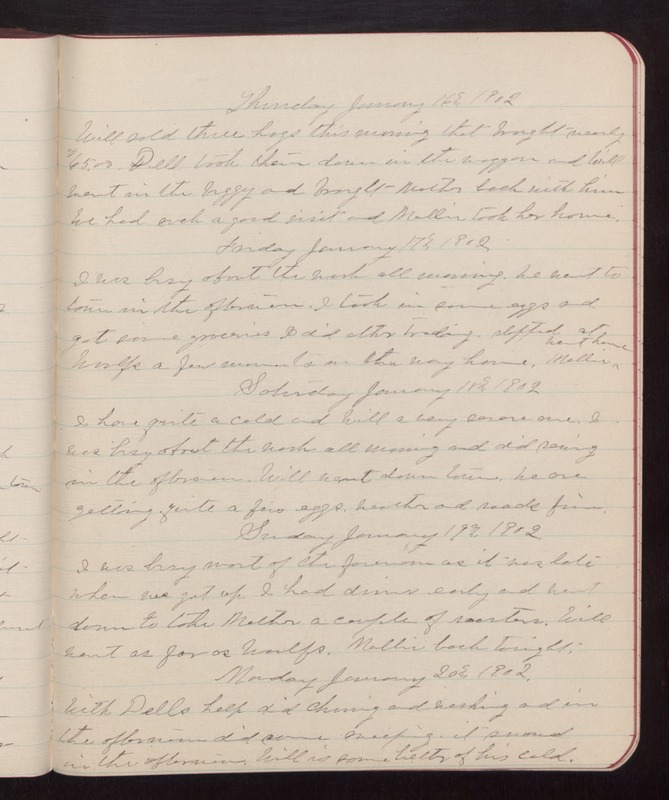 Sunday January 19th 1902 I was busy most of the forenoon as it was late when we got up. I had dinner early and went down to take Mother a couple of roosters. Will went as far as Woolfs. Mollie back tonight. Monday January 20th 1902 Wiht Dells help did churning and washing and in the afternoon did some sweeping. it snowed in the afternoon. Will is some better of his cold.